Manama : Eldar Eldarov made a statement in Brave Combat Federation by making his debut at Abu Dhabi World Pro Jiu Jitsu Gi competition prior to his fight at Brave 12: KHK Legacy hosted in Jakarta, Indonesia. Known for his powerful wrestling and sambo skills, Eldarov had not competed in Jiu Jitsu Gi competition so far. The head of KHK MMA Bahrain who trains the Bahrain National team for Amateur MMA pushed the limits by dominating the competition in his debut appearance. Currently fought ten fights in his career, Eldar had won all his nine appearances. 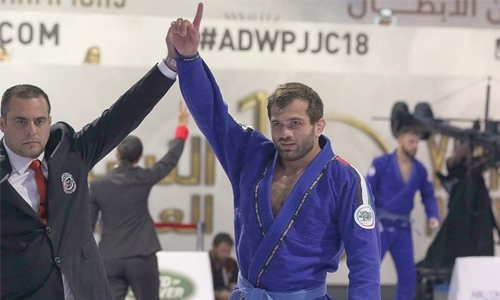 Eldarov fought three opponents at the Abu Dhabi World Pro, out of which he defeated two of his opponents. He was tied on 0-0 with his third opponent who was given the pass to move forward. With a dominating performance in his first ever appearance in the competition, Eldarov has yet again validated the excellent ground game he is famous for. He will face the 23 year of Brian Hooi from Netherlands who has an experience of fighting 22 professional fights in his career, which is one among the highest for his age.